I was preparing a rather lighter dinner than usual, lots of grilled veggies with brown rice and tempeh. 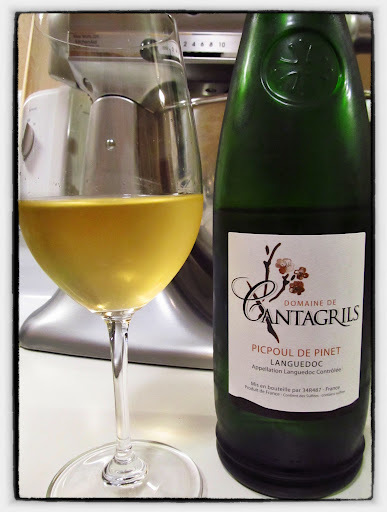 I had received Domaine de Cantagrils Picpoul de Pinet 2010 a month or so back from my wine club, and had been waiting for the best opportunity to enjoy a grape famous for its lip-smacking acidity and its excellence at being paired with seafood. Winemaker Claude Jourdan took over the winemaking at her mother’s estate in 1995. She has 3 different vineyards in iron rich, Jurassic soils, all with an average vine age of 25 years. She ages her Picpoul in stainless steel and allows it to sit on its lees for 3 months to emphasize its varietal character. Her wines receive rave reviews for their high quality and fantastic value. Gold in colour, aromas of lemon, fresh mint and sea minerals swirled about in the glass. Subtle flavours of pear and green apple were supported by a bright acidity in the light body. Zesty grapefruit mingled with traces of herbaceous sage in the racy finish. [My husband was enjoying lobster tails and said they highlighted a spicy white pepper edge to the finish.] Easy drinking, snappy and refreshing, this is a fantastic glass with shellfish and light meals.